Ist Euch kürzlich auch ein buntes Pferd über den Weg gelaufen? Denn unsere Tochter ist ja eine begeisterte Reiterin und sie verbringt viel Zeit im Stall ihres Vertrauens. Der Stall ist nicht weit von uns zu Hause entfernt und deswegen weiß ich, wo ich sie in der Regel finden kann, wenn ich sie vermisse. So war es auch gestern, denn da sie sich am Telefon nicht meldete, obwohl ich eine Nachricht für sie hatte, machte ich mich auf zum Stall. Dort angekommen glaubte ich jedoch meinen Augen nicht zu trauen. Ich schloss sie vorsichtshalber einmal kurz, da es sich ja um eine Sehstörung handeln konnte, doch als ich sie wieder öffnete, sah ich ganz genau dasselbe Bild wie gerade eben. Denn ganz entspannt marschierte ein knallbuntes Pferd an mir vorbei! Sprachlos starrte ich es an, da kam auch schon unsere Tochter auf mich zugeschlendert. Und ich dachte mir im Stillen, dass man ruhig auf Anhieb dem Glauben schenken darf, was man sieht – und dass man gar nicht immer alles in Frage stellen muss. Feiert Ihr Fasching? Was ist in Eurem Leben bunt? Wann hat sich Euer erster Eindruck bestätigt? Did you recently also meet a colourful horse? Because our daughter is indeed an enthusiastic horsewoman and she spends much of her time in the stable of her confidence. The stable is not far away from our home and that's why I know where I can usually find her when I miss her. And because yesterday our daughter didn´t answer the phone although I wanted to give her a message I went to that stable. Once there, I didn´t believe my eyes. As a precaution I closed my eyes briefly, as I thought maybe it could be a visual disturbance, but when I opened my eyes again, I saw exactly the same image as before. Namely, quite relaxed a brightly coloured horse marched past me! Speechless, I stared at the horse, since our daughter strolled toward to me. She recognized immediately how confused I was and grinned: "Now you are astonished, huh? But our stable is just so special that we even have totally colourful horses. But don´t you remember what I told you today?" Suddenly it came to my mind: "Yeah, right, I forgot this really! You have celebrated Carnival today in your stable. But I´m not able to understand, were the horses also dressed up?" Our daughter laughed: "No, our rider kids are responsible for that. Because one of the specials we offered the kids in the context of our Carnival party was to paint a horse. 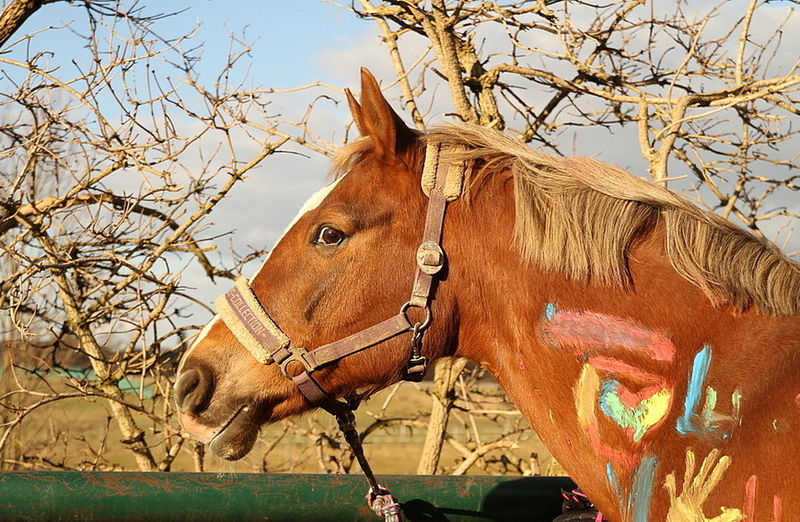 The kids had so much fun during they painted the horses and fortunately our school horses are so patiently, that they had any problems with this. But now we had the colour to remove by washing because otherwise even more people would be scared like you." I joined in the laughter of our daughter: "Yes, that's a good idea. Although I must say that I really like the horses also in such a colourful appearance." And I thought to myself that everyone should believe at the first sight in what they are seeing - and that it isn´t necessary to put into question everything. Are you celebrating Carnival? What is colourful in your life? On which occasion your first impression has been confirmed? That must have been a lot of fun for the kids. Hello, the beautiful are you! Thank you <3 I´m also in the country side today, this house is very lonely there are only the church nearby and very few houses :) So sorry that you have no time for costume parties, wish you that you enjoy at least your walks. Sehr schönes Ensemble, das gefällt mir so gut:) Wahrscheinlich funktioniert die Türglocke noch, oder? Fasnacht oder Karneval, das sagt mir auch nichts, das feiere ich nicht, Zürich ist protestantisch, und dort wo ich aufgewachsen bin, waren wir die einzige katholische Familie, das war manchmal merkwürdig, aber man gewöhnte sich dann mit der Zeit daran. Zum Religionsunterricht musste ich jeweils in die Stadt fahren, und auch zur Kirche, aber nur sonntags, und an hohen Festtagen. Als ehemalige Lehrerin und jetzt Abt.- Leiterin denke ich, dass ich mich gut auf mein Bauchgefühl mit dem ersten Eindruck verlassen kann, geirrt hatte oder habe ich mich bis jetzt noch nie, aber ich kann es natürlich nicht ausschliessen, dass ich mich auch einmal irren kann oder könnte. Ich denke auch, dass etwas daran ist an dem Sprichwort, dass das Glück der Erde auf dem Rücken der Pferde liegt, obwohl ich selber auch nicht reite, sehe ich wie glücklich das Reiten unsere Tochter macht. Und dann feierst Du genauso wenig wie ich Fasnacht, Karneval oder wie es auch immer genannt wird … und ich kann mir vorstellen, dass es nicht ganz einfach war, dass Ihr einen anderen Glauben hattet als Eure Umgebung. Du hast sicher ein hervorragendes Bauchgefühl, davon bin ich überzeugt. Ich wünsche Dir von Herzen, dass Du Dich auch weiter darauf verlassen kannst. I love your blazer dear! Kisses. Wunderschöner Blazer und Look! Aber ein Kostüm kann ich da noch nicht wirklich erkennen :). Ich persönlich war noch nie Fan von "Lustig auf Komando" - aber dem Pferd steht die Farbe wirklich gut :). Dear Rena your jacket is so full of colors..love it! Den Blazer würde ich aber auch ohne Karneval gern tragen - der ist toll!!! Zu Deiner Frage mit den Frisuren - da geht es mir wie Dir :) - eine Lieblingsfrisur und die gern andauernd! 1. dass wir meinen Blazer auch außerhalb vom Fasching tragen würden. Oh, I fall in love with your shoes, this pair looks amazing and would go well with anything! Brilliant and elegant outfit, you look so feminine as always) Those photographs are adorable! nice jacket and bag, love it! Knallbuntes Pferd :D sehr gut ^^ sehr kreative Bemalung - find ich super. Die Tasche finde ich schön - tolle vielseitig einsetzbare Farbe. Ich war auch besonders von der Kreativität der Pferdemaler begeistert :) Danke, dass Du meine Tasche schön findest, denn ich habe wegen der Farbe länger überlegt und mich letztlich für diese entschieden, da ich wie Du der Meinung bin, dass diese Farbe universell einsetzbar ist. I love the jacket, it's gorgeous! I've post my second post, check it! Awww the horse is too cute and fits in the colorful carnival theme so well. I love love this beautiful floral blazer, its exactly the type of look I personally like to wear, you look splendid! Thanks for sharing your fashion views with me...Have a great start to March! nichts gegen das bunte Pferd (das sehr artig sein muss, mein Ross könnte da kritischer sein), aber dein bunter Blazer gefällt mir noch um einiges besser! Vor allem vor dem dunklen, schlichten Hintergrund (Shirt, Hose, Tasche), den du gewählt hast. Es steht dir ausgezeichnet. Besonders erwähnen muss ich noch deine Pumps, weil mir die Farbe sehr gut gefällt. Ich hoffe, du hast in diesem Outfit einen fantastischen Start in die Woche! Du hast recht, das Pferd ist sehr artig, vermutlich deswegen, weil es als Schulpferd im Einsatz ist :) Vielen Dank für Dein Lob, da freu ich mich. Denn als ich das Outfit anhatte, fand ich es auch ganz gut, aber als ich es dann auf den Fotos gesehen habe, war ich gar nicht mehr so überzeugt … Mein Start in die Woche war gut, danke der Nachfrage, ich habe keine Ahnung, ob das an meinem Outfit lag :) Hoffentlich war auch Dein Start in Deinem Sinne und glücklich. Haha...bless the horses. I cannot believe that they allowed the kids to paint them. I think they were in carnival mood as well so the horses did not react and was fine with the kids splashing all the colours on them. I love your floral and colourful coat Reba, it looks beautiful in you and you look stunning as always. That jacket!! I love it so much! You know I'm obsessed with florals! świetny blog! Zapraszam na www.way2dress.blogspot.com do obejrzenia moich relacji z NYFW! Das Pferd hat meiner Tochter besonders gefallen! Mir gefällt lieber Deine bunte Jacke! Echt schön! What a pretty look, love that bag!!! Du hast einfach den Durchblick! Ich mag Fasching und Karneval auch gar nicht – ich argumentiere auch immer damit, dass ich praktisch ja das ganze Jahr über wie im Fasching gehe :) Danke! Liebe Rena the jacket is so pretty an the colors is so pretty!! After I read and finished your story, Dearest Rena, I was laughing how cute it is, I would do and feel the way if I see my daughter doing that. I did picture your reaction on how you first saw your girl. The last time I had ride the horse was a few years ago when I had a vacation in Mexico. It was fun. Load of kissessssssss and biggest hug! Thanks for reading, dear Tanya! I can imagine you would have also many pleasure with a daughter – and I wish you if you want it that you have as soon as possible an opportunity to ride a horse. Thanks for your feedback, to be honest my bag is for me the best part on my outfit and I can imagine that such a bag would look wonderful on you! Load of kissesssssss and biggest hug! I love how the floral prints stands out against the black! Wonderful outfit! This year I hadn't celebrated the Carnival, sometimes I do, sometimes I don't...depending on how much time I have on my hands. The coluorful horses were surely an interesting sight! It's lovely that the children had an opportunity to have so much fun! I'm happy you too like Amy Tan's books. So far my favourite novel by her is The Joy Luck Club. In hard times in life, we must create our own luck. Many thanks Ivana! It´s great that you are so flexible in general and regarding your Carnival habits, too. I like Amy Tan’s books really and I remembered so well how much I loved to read “The Joy Luck Club” (in German “Töchter des Himmels”), too. I agree this is a wonderful book and although I normally don´t reread books now I´m thinking honestly to read this book soon again :) Thanks for your input! I love your floral blazer and this bag is to die for!!!!!!!! Hinreißend! Ich liebe den Kimono! I have had couple of times when my first impression was right, but there were occasions when I was wrong, but I don't believe in love from first sight, it can be passion from first sight but not love, do you agree with me darling? Dear Rena, I also mentioned carnival in the last post. But I think nothing can be compared with "coloured" horses because of carnival :) Great idea! Like your "easy/soft" outfit specially grey shoes...I have many grey winter-clothes so I could fit them with many pieces. Dear Sily, I like it that we wrote about the same topic :) Thank for your feedback! Hi Rena in my country carnivals are held in February and the custom is wet with water and paint their faces with colored paintings, well so what held me as a child, but now the water saving and tradition encourages it's gone lost over the years, by the way I love your blazer look today! So you celebrate Carnival also in a totally other way than we here in Bavaria! Thanks for sharing it, it sounds interesting! I love this post! You look lovely in this outfit! Wish you many success in your studies – Psychology is really a good choice! You look stunning!!! Love your heels and cute bag so much. Souds like your horse had a wonderful carnival day. It is not everyday he gets to be all colorful. You look great Rena. Love the jacket and the bag and the heels and and and......well I love everything. Nope I haven't, I can't even remember when I've last seen a horse, though. Thx bunches for your lovely comment, I always looking forward to your comments. I´m always looking forward to your posts and I love it to comment them! Painting a horse sounds like an interesting day! LOL! We don't celebrate Carnival here in Canada but it sounds color and fun! Love your jacket! The print is just beautiful! Love your jacket, great outfit, dear! Hmmm....I must say I don't really approve of children painting a horse, I feel this doesn't teach them to respect other living creatures. But of course I know they didn't hurt the animals or anything. Many thanks for your important hint, dear Marta, I thought honestly about it and I will tell your thoughts to our daughter, because it is essential to teach children respect to other living creatures. And thank you also for loving my outfit! Hi Rena, a quick note to let you know that I'm planning on selling my Ganni coat, so drop me a note if you're interested (pinto.carole@gmail.com)! I'm in love with your bag!!!!! so beautiful! das pferd ist genial :D und ich liebe deinen floralen blazer! "Feiert Ihr Fasching?" - nein, hatte ich noch einen Draht dazu. "Was ist in Eurem Leben bunt?" - ich glaube alles um mich herum und meine Lebenseinstellung. Ich glaube, wenn dem nicht so wäre, würde ich nicht dieses feminine Gefühl spüren, daß mich zum "Frausein" ermundert. "Wann hat sich Euer erster Eindruck bestätigt?" - zumeist recht oft - habe jetzt kein bestimmtes Beispiel. 1. Verstehe ich total gut! 2. Das ist richtig schön! 3. Davon bin ich überzeugt, dass das bei Dir recht oft vorkommt. verdammt, finde es immer schlimm meine Fehler hier und da in meinen Kommentaren zu lesen. Zum Glück weißt aber meist was ich meine. Aber dieses kleine Antwortenfenster ist echt nervig - warum haben die das nicht größer angelegt?